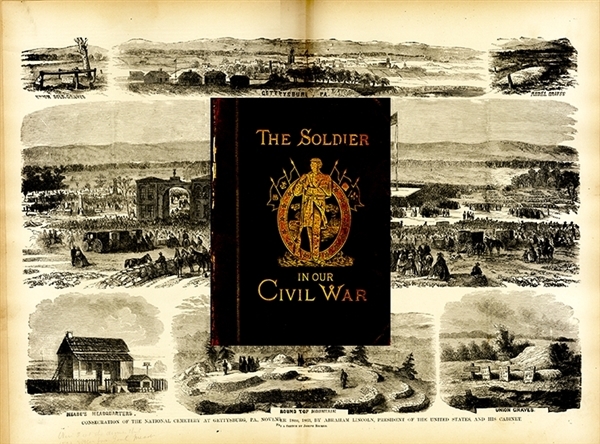 In two bound volumes, “The Soldier in Our Civil War: A Pictorial History of the Conflict, 1861-1865, illustrating the Valor of the Soldier as Displayed on the Battle-Field”, first edition, 1890, 421pp, (&) 444pp. Illustrated throughout with numerous wood cut illustrations from sketches taken on the battlefields by illustrators such as Forbes, Waud, Taylor, Hall, Becker, Lovie, Schell, and Crane. Full gilt and black stamped dark brown buckram. the 1st volume has facing engravings of Presidents Lincoln and Davis. The 2nd volume has facing engravings of generals Lee and Grant. These huge volumes use war period engravings to tell the story of the war. Boards are present yet loose. Retains the original gilt pictorial cloth design of a soldier standing in a circular device with flags waving & the title.